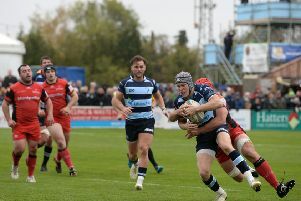 Tickets for the British & Irish Cup final are now on sale after it was confirmed that Bedford Blues will meet Jersey in the quarter-finals on Friday, March 11. While the Blues, who topped Pool 2 of the competition, face Jersey with a 7.45pm kick-off, the other fixtures will see Leinster A facing London Welsh, Yorkshire Carnegie hosting Moseley and Cornish Pirates being drawn at home against Doncaster Knights. Should the Blues overcome the Islanders, they would travel away for a semi-final clash against the winner of the Yorkshire Carnegie versus Moseley tie. The winner of this semi-final would then host the British & Irish Cup final on the weekend of April 8-10. You can buy discounted tickets for the British & Irish Cup quarter-final by visiting www.bedfordrugby.co.uk – season ticket holders have a two-week window to claim their reserved seat for the match; either call the club, pop in or email season@bedfordrugby.co.uk with your name and book number. A special two-course hospitality meal will be available in the Blues Marquee pre-match for j£15 per person. Email sophie@bedfordrugby.co.uk to book in while places remain. The Friday night lights date will set up a tantalising rugby weekender, with Eddie Jones’ new look England facing Wales at Twickenham on the Saturday which will also be screened at the club.